She/He became an initiate of the coven, but for whatever purpose, decided to leave on GOOD TERMS, and yet wishes to remain loosely connected with the group. In this case all coveners must agree to accept them into the outer court and an officially written invitation (usually included in their release letter) must be offered unto them. She/He applied to become a member of Twisted Oak, but for whatever purpose, was denied, but offered membership in the Outer Court. This could be because they need to work out personal things before joining as a coven member. In this case, all coveners must agree to accept them into the outer court and an officially written invitation will be sent to them. To become an Outer Court member, one needs to attend at least two (2) Sabbats with Twisted Oak. Affiliation does not happen by request so much as it happens due to frequent attendance to Sabbats. (Contact Lord Alexian for your invitation to attend a Sabbat as a guest.) After attending two (2) Sabbats, please approach Lord Alexian and Lady Midian about becoming an official Outer Court member. 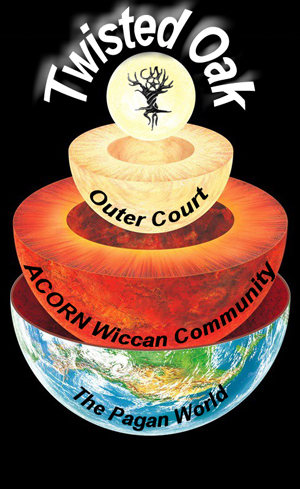 As an Outer Court member, you will remain in our Twisted Oak Facebook Group, and will be well informed of all the Sabbats/Socials/Open Classes that you can attend. Please note that attending 2 Sabbats/Classes a year is still required to remain a member of the Outer Court and the Facebook Group. This promotes room for others who are interested. Alexian purges the Facebook group regularly of people who have not attended at least two Sabbats since the anniversary of them being added to the Facebook Group.